I've been in a brownie mood lately, especially for recipes that are a little out of the ordinary. This time around, I wanted to use some hazelnuts I had in my freezer and caramel sauce in my pantry. Some recipe surfing led me to Paula's blog of Bell'aimento, which was when I decided to make these Hazelnut Caramel Brownies... ah-mazing! 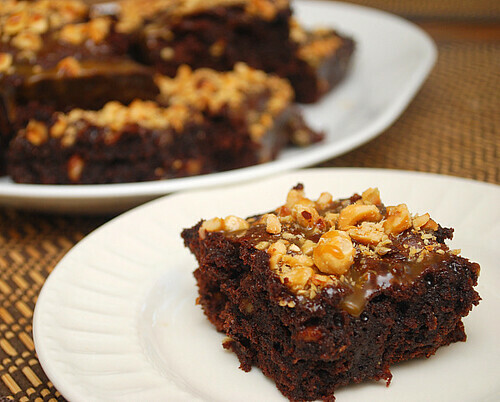 This is just a simple brownie recipe topped with buttery caramel and crunchy toasted hazelnuts... what's not to love? 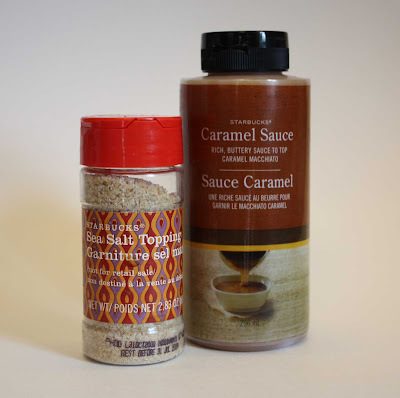 You can use store bought caramel ice cream topping or make a homemade caramel sauce if you prefer. As for me, I'm a big fan of Starbuck's bottled caramel which can be purchased at some Starbucks cafes. I got my hazelnuts (aka filberts) from a great nut company called Oh Nuts! If you have difficulty finding hazelnuts, feel free to substitute with your favorite nuts like walnuts, pecans, cashews, etc. 1/2 stick unsalted butter - room temp. In a medium bowl whisk together the flour, baking powder, salt and cocoa powder. In the large bowl, cream together the sugar and butter until creamy. Add in eggs one at a time and mix well. Add in your vanilla. Gradually add the flour mixture until it’s well combined. Batter should be thick & sticky. Fold in 1/4 cup of the hazelnuts. Spray an ovenproof 8 x 8 dish with cooking spray. Place a piece of parchment paper (slightly larger than your dish to allow for handles) inside. It will adhere to bottom of dish. Place the brownie batter into the prepared pan and smooth out the top. Bake in the preheated oven for 30-40 minutes until sides are firm and center is no longer giggly. Remove brownies from the oven and drizzle with half of the caramel sauce. This will seep into the brownies as it cools. Allow brownies to cool completely. Before removing and serving, drizzle the remaining caramel sauce over the top of the brownies and sprinkle with remaining hazelnuts. YUM! These look amazing, and I hear ya - I was on a brownie kick for 2 weeks....now I'm on a cookie kick. I don't know what is about sweets, it always puts me in a wonderful mood! These sound amazing! I think I'm going to make them for my True Blood party on Sunday night. :) Thanks for sharing, Joelen! WOW!!! These look so fudgey!!! Just the way I like brownies!! Great looking brownies. Hazelnuts make anything better. I love Bell'alimento's blog too.